“Blue Like Jazz” arrived at selected theaters this past week, an odd stepchild among usual movie fare of aliens, vampires, and things that go boom. Derived from Donald Miller’s book by the same name, “Blue Like Jazz” is a story of life and faith during a young man’s first year of college. Don, the main character, is son of a bible believing single mother who wants to protect her son and an atheist father who is emotionally disconnected, mostly absent, and religiously hostile. Donald’s Dad wangles an acceptance from Reed College in Portland, Oregon, a school filled with intellectually brilliant and morally unfettered not-quite-adults. After struggling with it, he heads to Reed and Portland instead of the Baptist college his mother wants him to attend. Soon life is filled with Political Correctness, drugs, booze and moral haze. The professors challenge every aspect of life, and students engage in protest and outrageousness as an extracurricular activity. From that point we follow Don as he struggles with the pain of the life he has left behind but the faith that won’t leave him alone. He is ashamed of that identity, and tries to fit in, but never really does. The church is an ambiguous presence throughout the movie. The childhood church that Don leaves behind is a stereotype of tacky children’s sermons and fear of the world. The youth pastor is glib, a know-it-all, self-assured, and, it turns out, secretly sleeping with Don’s mother, which brings a crisis into his life later in the story. drunken student go to Portland to commit a protest against a church. This wins him accolades at the school that deepens his spiritual crisis and brings alienation from another key character in the film, a young woman named Penny. Her spiritual journey is part of Don’s eventual redemption. The movie turns on a couple of devices. First, throughout the movie the narrator, Don, tells us the elements of a story. This is important in many ways. Not only does it help us move through the story, but it is a continual reminder that Christianity does its best as a living narrative and not like a stock report or a set of assembly instructions. Story, it seems, is hard to turn away from. Especially the Jesus story. What? Your school doesn't have a Pope with a shopping cart on fire? I never liked jazz music because jazz music doesn’t resolve. But I was outside the Bagdad Theater in Portland one night when I saw a man playing the saxophone. I stood there for fifteen minutes, and he never opened his eyes. After that I liked jazz music. A jazz pianist told me once that with jazz you start with the melody, but you never know where it will go. It’s anchored in that melody, and it never completely disappears, but sometimes it’s hard to hear. It’s woven among improvisation and relationship among the musicians. This openness can lead people to think jazz is a kind of eternal existentialism, where there is no truth, there is only free-formlessness, where we invent ourselves again and anew in every moment. Don in the movie takes his dad’s jazz vinyl albums with him and plays john Coltrane’s “A Love Supreme “. This is a profoundly significant symbol. Coltrane stands as one of the monuments of modern jazz, and an intersection between inventive creation and primordial archetype. Coltrane’s last works before his untimely death was preoccupied with spirituality. 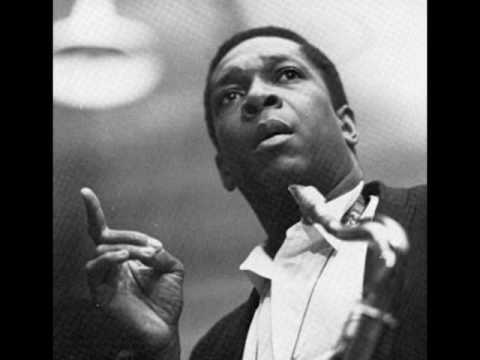 Arguably the apex of Coltrane’s work was “A Love Supreme,” in 1965, which plays several times in the film. The album mirrors the four movements of story in Miller’s film and is a musical monument to Coltrane’s own spiritual quest. “Blue Like Jazz” is a rowdy, thoughtful cinematic “Confessions.” And there is a confessional at the end, which will not be a surprise to readers of the book, but it is told differently. Don’s turn on “confession” is surprising, heartfelt, and touching. There is no simple answer at the end, but that is not to say God doesn’t come off well or that it is not a film about faith. 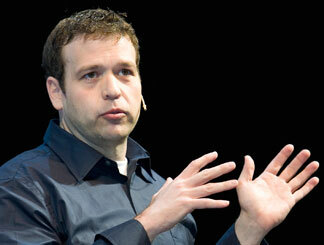 Don Miller’s God is solid, elusive, mysterious, and genuinely possible. But “Blue Like Jazz” resists turning into the Billy Graham film I saw in high school, “The Restless Ones.” The characters don’t walk forward at the crusade and there were no counselors waiting at the front of the theater. Christians who go looking for this will be disappointed. I was grateful, for even in high school, I felt something more like embarrassment that we had been snookered in to a revival at the movie theater when we weren’t watching. Satisfying artistic experience tells the truth. “Blue Like Jazz,” both book and movie, finally resolve to an uncomfortable truth—that God climbs into no one’s boxes that can keep God in, only into the ones we make to keep God out. The church would be better served to abandon box-building and marketing in favor of serving the incarnate Mystery and becoming the story we talk about. This is not for young children. It probably isn’t a good movie for parents who are sending a child to college next year. 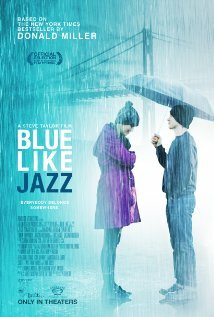 But as far as a film that delivers characters to care about and some honest questions to think about, “Blue Like Jazz’ delivers nicely. Go see it. You’ll keep thinking. Posted on April 25, 2012, in Art, Books, Christianity, Creativity, Faith, Jazz, Movie Reviews, REVIEWS--Books, Movies, Music, Theology, Writing and tagged Blue Like Jazz, Christianity, College, Donald Miller, faith, God, Jazz, John Coltrane, movie reviews, movies, Postmodernism. Bookmark the permalink. Comments Off on “Blue Like Jazz”: Not Your Father’s Evangelical Movie.